Congratulations to "Jen C", the winner of Julie's giveaway. Thank you to all who participated! I’ve been thinking a lot about going through phases lately. Yes, partly because of the change of seasons (although we’ve had more winter weather this spring than we had back in December! 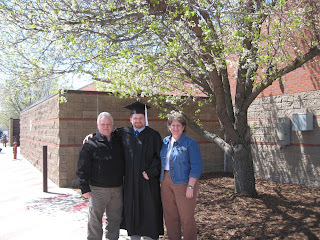 )—but most notably because my son graduated from college this weekend. There were many tears (mine!) and lots of pictures and hugs and celebrations. With his double major in Music Business behind him now, after a tremendously successful college career (yes, I’m a proud mama!) he’s embarking on the next phase of his life. Right now he wants to work, but he’s thinking seriously of going on to get his Master’s or attend a trade school to get a degree in instrument repair. Plus, he’s set to go to California for some networking/job interviews later this year. But what an exciting time for him! He has a level of maturity and preparation to go along with his hard work ethic and musical talent, and goofy, sensitive personality that has readied him to launch into whatever comes next. Probably with an honest degree of trepidation—the unknown can be a little scary—but also with excitement and anticipation and an eagerness to explore that next chapter of his life. Precinct:Task Force miniseries and finishing up the last book on a contract, I’m preparing for the next phase—that brand new contract for the next several books I’ll be writing. I’ve consulted with my agent and chatted with my editor. I’ve surveyed readers through blog posts and my Facebook page. I’ve let my imagination do what it does best—dream up characters and situations, analyze my favorite story hooks, think of different projects I’d like to write. Truly, this is probably the most fun aspect of a writing career for me—that time between big projects when deadlines have receded and the creative world lies ahead of me. There are no restrictions on me at this phase of writing. What existing supporting characters do I love best and want to feature in a story? What mysteries would I like to solve? What’s something new and different that will challenge me creatively, yet remain true to reader expectations? As I told my editor, I’ve never had a problem coming up with ideas. My sticking point is narrowing down the possibilities and deciding what is best for my readers and me. I love this phase of being a writer. There are no limitations on me. Once I start writing a book, I’m committed to those characters and plotline. And while there are always opportunities to be creative, of course, once I sign a contract, I’m tied to the expectations of a line or publisher as far as content, length, etc. But right now, this is the free time for me. I want to write a longer, sexier book—still romantic suspense, but with grittier details and steamier sensuality. I want to write a new trilogy of Intrigues because of I love putting the pieces of each story together like a puzzle. I want to write some stand-alone books that feature characters who’ve become reader favorites. I’d like to write another paranormal romance, too. Although nothing is set in stone yet, I have a pretty good idea of where my imagination and commitments will take me through this next phase of my writing career. Like my son, I’m a little bit anxious, but am truly looking forward to beginning that next new phase in my life. Any new beginnings or landmark events happening in your life? Please share the good news or let us cheer you on if you’re gearing up for something new. I’ll be giving away a signed copy of my June release, ASSUMED IDENTITY, to one lucky poster. Giveaway ends 11:59pm EST May 10th. Please supply your email in the post. You may use spaces or full text for security. (ex. jsmith at gmail dot com) If you do not wish to supply your email, or have trouble posting, please email maureen@justromanticsuspense.com with a subject title of JRS GIVEAWAY to be entered in the current giveaway. US or CANADA postal addresses only. Hi, Julie. Congrats on your sons graduation! I know how proud you must be. Can't wait to see what your next adventure is going to be. Love your writers voice. As for new beginnings, I try to make one each day. Raising my three grandsons (11, 13, 14) is quite an adventure of it's own...smile. Thanks, Brenda! (on both Ryne's graduation and my writing ;)) Sounds like you have your hands full--I bet there's a new adventure every day with three grandsons around. I haven't heard of this book before so I am glad that I stopped by this blog!! I would love to win!! Thank you!! I'm glad you stopped by, too, Amy! I'm always thrilled to meet new readers. ASSUMED IDENTITY is actually the 48th book I've written--mostly in romantic suspense. And it includes my all-time favorite theme: a Beauty & the Beast story. I hope you enjoy it! You can see all my books, read blurbs on each of them, enter my monthly website contest, read my monthly newsletter and more on my website at www.juliemiller.org. Glad to "meet" you here! I have yet to read any of your books. I will save your page in my favorites. I just LOVE Romantic Suspense books! Thanks again. Well, Sophia, I hope you'll give them a try. I think ASSUMED IDENTITY might be a good place to start. Or choose whatever speaks to you! I'm a huge RS fan, too! And I'm always pleased to "meet" another RS fan! Thanks, misty! And best of luck with the new job! Julie congrats to your son and to you for things to come! Looking forward to whatever your creative mind creates to share with us in times ahead... best wishes for your writing! Thanks, Colleen! I appreciate all the good wishes, too. I hope to see you in New Orleans for RT next year, I am a little nervous as I begin the last leg of my jounrey in getting my degree, It has taken me a little longer than I thought it would.However as I see the light at the end of tunnel the self doubts kind of creep up and I have to remind myself that I can do it. It is diffcult to keep giving yourself the happy pep talk when there negative nasayers close by. Then I remind myself that they are stuck in a rut of their own making and can't accept that others work for their goals. Congrats on your son's graduation and may you continue writing your great books. Thanks, Edna! And continued good luck (even though I know it's mostly a lot of hard work ;)) with your schooling to earn that degree. Yes, sometimes those naysayers can be pretty loud. But think of your goals and how you'll feel when you achieve them. Think of those who DO support you. And yes, I think you're right, sometimes those naysayers are loud because they don't understand or they aren't comfortable with change. Not everyone has an imagination. Not everyone dreams big dreams. For those who don't, I think they get pretty anxious about changing the status quo--anxious for themselves, and perhaps even worried for you because, like you said, they can't see the bigger picture. That's okay, bn100--you're name will be entered. Hope all is going well. Congrats on everything you have going on. I bet you are a proud Mama. Your newest release sounds great as always. Julie you are absolutely one of my all time favorite writers. I tell anyone who will listen to read your KC books. Any of them and when they do, they're hooked. Congratulations to your son and his graduation! And good luck with what ever he does. Also, have you ever thought about writing another Blaze? I know, I'm showing my age but I really liked those, too. You will figure it out and I hope KC figures into your future plans. Thanks, Marika! I'm awfully flattered. I'll take all the good wishes for my son, too-thanks! As for Blaze, I'd love to write another one, but that probably won't happen anytime soon because Intrigue is keeping me so busy. That said, I may have some news soon about writing for a new digital imprint called Intrigue Noir, which as one editor said is a "longer, grittier, Blaze-ish" version of Intrigue. So fingers crossed! It wouldn't be a Precinct story, but a stand-alone romantic suspense with the Blaze-ish heat level. I'll also have some details to share soon re several new KC cop stories I'll be writing for Intrigue! I think that is very exciting Julie. I have loved all your series of RS, starting with the Taylor Clan, The Precinct etc. I am sure I will love whatever you go with next & cannot wait for Assumed Identity. Keep up the great work & best wishes for a fulfilling future. I just got a Facebook message from Lil Sis. Is anyone else having trouble posting comments? Congrats, Julie, your son is the product of two wonderful parents. And thanks, Lilsis! So glad that you guys could join us for the celebration! Hi Julie. Sounds like a really interesting read. I love romantic suspense. I have read several of your books and I loved them all.